Sold everything off. Fun while it lasted! I took it offline about a month ago and haven’t been running anything since. I was having issues with 0 phosphate and nitrate and washed out colors. I have run it pretty wet, then ran it dry before finally taking it out due to not seeing params increase. I was running it in around 7 inches of water I believe on setting 2.5ish. I didn’t have any issues on getting it to produce. I don’t think one clown is enough bioload for it to really produce much skimmate but I’m a noob. i started dosing nitrogen last week after a month of taking the skimmer out and increased feedings still had nitrate and phos bottomed out. Colors have done a complete 180, everything’s growing and looking good finally. I believe I was also running way too much grape bubble macro in the sump. I had been letting it fill the refugium area on the sump, but have been keeping to fist sized with a trim every week. added 2 emerald crabs for some bubble algae and a peppermint shrimp to curb an explosion of aptasia. I hate both crabs and shrimp, but my Lfs sells berghia for 15$/per and with the number I’d need, taking my chances with a shrimp instead. Crabs have been working, time will tell how the peppermint works out. picked up a few frags since last update. Forest fire and bubble gum digi colony, pc rainbow colony, pink diamonds, jubilees, Nirvana colony, number of other zoas or sticks I’m forgetting. 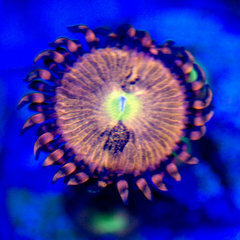 Sps frags have been encrusting at a good clip, and just started dosing brs 2 part. Had just been doing weekly WC but tested alk for first time in months and it was at 5.5. Now keeping it at 7.3 as that’s what my salt mixes to. Switched from Red Sea blue bucket to HW few weeks ago, everything’s responded real well to it. crappy iPhone pictures. Still need to grab the real camera I have back home being used by my dad. Planned to go with a softy tank, find myself buying more and more sticks..
Dino’s either went away or it was brown cyano, after I started feeding more, added 2 cardinals and skimmed dry they went away and I had several different algaes and a little red cyano pop up. Performed a 30% wc today and will turn skimmer a little more wet. So relieved i dodged the Dino bullet. 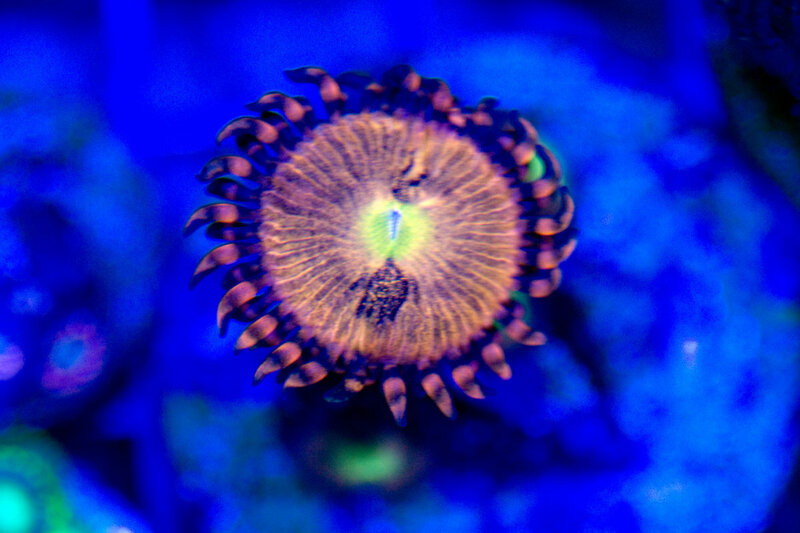 I have a couple really nice acros coming next weekend from a local reefer. The slimer and digi made me want a few more sps. Right rock scape is going to get some more acans or shrooms, and will fill some spots with some zoas or shrooms. Saw a tiny spot of this a few weeks ago, chalked it up to cyano and a new tank. I upped nutrients in the tank and added 2 cardinals as coral were washed out and nitrates/phosphates were 0. 2 days of having the skimmer off and what I think are Dino’s spread to multiple places. Had them a few years ago and after months of battles I tore down the tank. Going to switch skimmer back on and see what happens.